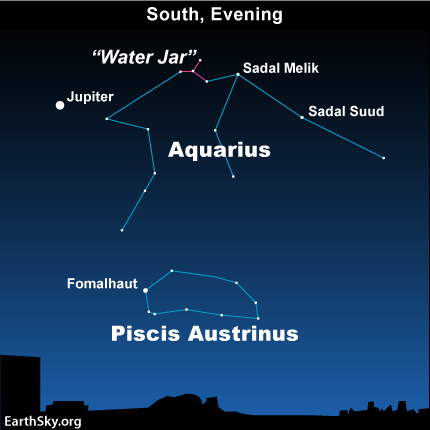 Will you spot the Water Jar in the constellation Aquarius to the west (right) of the blazing planet Jupiter tonight? You are only likely to see the Y-shaped Water Jar and the stars of Aquarius if you have access to a dark sky. From downtown in a major city, you have a good chance of spotting Jupiter at nightfall and early evening, but that might be about it. Look for Jupiter to blaze in the southern sky at nightfall and early evening. In urban or suburban skies, you may catch Fomalhaut to the lower right of Jupiter, if you have an open view of the southern sky. It is the only bright star visible in the south on autumn evenings. That is why astronomers often call it the “loneliest” star. Though Fomalhaut ranks as a first-magnitude star, it comes nowhere close to matching Jupiter in brilliance. Fomalhaut’s constellation – Piscis Austrinus – represents the Southern Fish. It lays to the south of the constellation Aquarius the Water-Bearer. If your sky is dark enough, you can see a little “asterism” or noticeable pattern of stars within Aquarius – marked in pink on our chart just to the left of the star Sadal Melik. It’s called the Water Jar in Aquarius. Some 30 faint stars, visible in very dark skies, make a zigzag stream of stars flowing down toward the star Fomalhaut. Again, you need a very dark sky to see this. 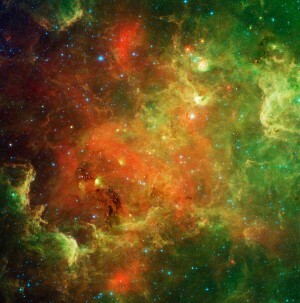 We didn’t try to reproduce this zigzag line of stars here, but, in a dark sky, it is very noticeable. This zigzag line of stars represents water from the Water Jar of Aquarius, flowing into the open mouth of Piscis Austrinus, the Southern Fish. See if you can find the Water Jar to the west (right) of Jupiter on some dark night!